High gain, directional Wide/Multi band cell phone antenna - for 800/850MHz Cellular and 1900MHz PCS, 800/900MHz iDEN/Nextel/SMR, Euro/Asian standard 900MHz and 1800MHz, WCDMA 2.1GHz and the 2.5GHz WiFi band. The main benefit of the this unique multi-band Yagi antenna is its ability to focus its signal in one direction leading to the greater gain figures. This antenna is designed for use on stationary objects such as buildings. If this antenna is not correctly aimed, it will lose its effectiveness. 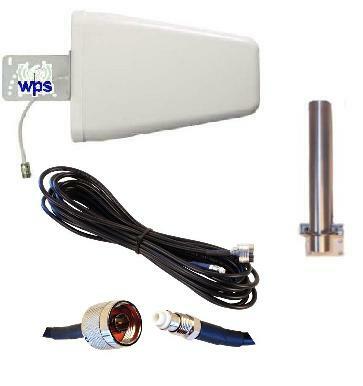 This unique multi-band directional antenna covers the entire spectrum from 800 MHz to 2.5 GHz and can be used for all cellular frequencies including North American standard 850 and 1900 MHz bands, Euro/Asian standard 900 and 1800 MHz bands, WCDMA 2.1 GHz, Nextel 800 MHz, and the 2.5 GHz WiFi band.